At Eos, we believe in being the healthiest version of yourself. We are a specialized outpatient surgical center who focus on same day procedures. Located in the heart of Beverly Hills, right next to Cedars Sinai Hospital, we are conveniently located in the middle of Los Angeles. We are a JCAHO and Medicare certified outpatient surgery center meeting the highest standards and the strictest criteria for certification. This process is undertaken every three years to ensure patient safety. Additionally, surprise inspections can be performed at any time. Why have your surgery at an outpatient medical center? Ambulatory surgery centers are made for healthy patients who can go home the same day after their surgery. They provide a better value compared to a hospital setting because the costs are between 17-57.6% less in a surgery center. Safety: Studies have shown that the risk of a surgical site infection is 50% less in an ambulatory surgery center compared to hospitals. Convenience: There are significantly less unplanned operations which means that your surgery will run on time and on the day that it is scheduled. These surgeries, since they are more routine, are also more predictable as far as the time it takes to complete. Our operating room has floor to ceiling windows and overlooks beautiful Beverly Hills. There is plenty of natural light and stunning views so that you can relax while the Eos team takes care of you. Dr. Kim has over 25 years of experience as an anesthesiologist. His mission is to keep you safe, comfortable, and monitored every step of the way. He specializes in a deep sedation anesthesia technique that results in you waking up feeling refreshed, not groggy or nauseated. He has experience with all types of anesthesia so he is well equipped to handle your care. Originally from Philadelphia, and trained in New York City at NYU, Dr. Kim learned the necessary skills to make him our favorite anesthesiologist to work with. 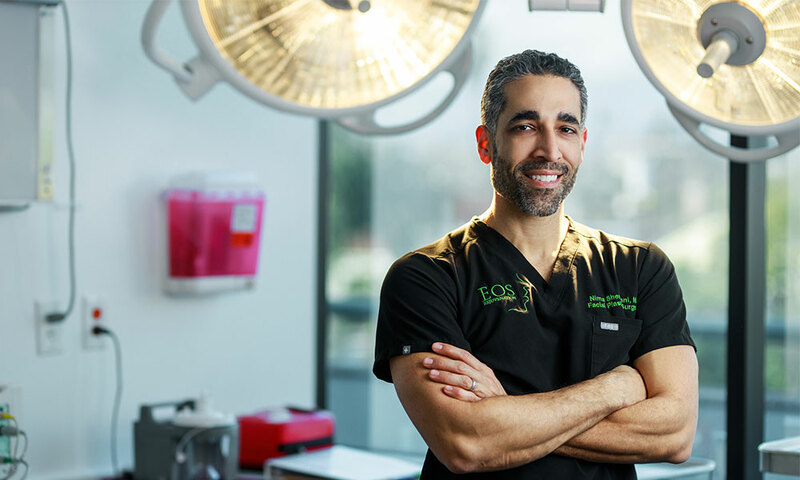 He has lived in Los Angeles for the last 20 years and has been working with Dr. Nima since 2012.